Think about what a complex system a modern economy is. It includes all production of goods and services, all buying and selling, all employment. The economic life of every individual is interrelated, at least to a small extent, with the economic lives of thousands or even millions of other individuals. Who organizes and coordinates this system? Who insures that, for example, the number of televisions a society provides is the same as the amount it needs and wants? Who insures that the right number of employees work in the electronics industry? Who insures that televisions are produced in the best way possible? How does it all get done? There are at least three ways societies have found to organize an economy. The first is the traditional economy, which is the oldest economic system and can be found in parts of Asia, Africa, and South America. Traditional economies organize their economic affairs the way they have always done (i.e., tradition). Occupations stay in the family. Most families are farmers who grow the crops they have always grown using traditional methods. What you produce is what you get to consume. Because things are driven by tradition, there is little economic progress or development. Command economies are very different. In a command economy, economic effort is devoted to goals passed down from a ruler or ruling class. 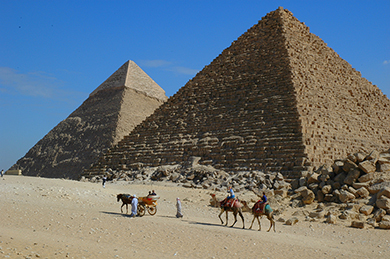 Ancient Egypt was a good example: a large part of economic life was devoted to building pyramids, like those shown in Figure 1, for the pharaohs. Medieval manor life is another example: the lord provided the land for growing crops and protection in the event of war. In return, vassals provided labor and soldiers to do the lord’s bidding. In the last century, communism emphasized command economies. In a command economy, the government decides what goods and services will be produced and what prices will be charged for them. The government decides what methods of production will be used and how much workers will be paid. Many necessities like healthcare and education are provided for free. Currently, Cuba and North Korea have command economies. Although command economies have a very centralized structure for economic decisions, market economies have a very decentralized structure. A market is an institution that brings together buyers and sellers of goods or services, who may be either individuals or businesses. 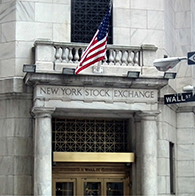 The New York Stock Exchange, shown in Figure 2, is a prime example of market in which buyers and sellers are brought together. In a market economy, decision-making is decentralized. Market economies are based on private enterprise: the means of production (resources and businesses) are owned and operated by private individuals or groups of private individuals. Businesses supply goods and services based on demand. (In a command economy, by contrast, resources and businesses are owned by the government.) What goods and services are supplied depends on what is demanded. A person’s income is based on his or her ability to convert resources (especially labor) into something that society values. The more society values the person’s output, the higher the income (think Lady Gaga or LeBron James). In this scenario, economic decisions are determined by market forces, not governments. Most economies in the real world are mixed; they combine elements of command and market (and even traditional) systems. The U.S. economy is positioned toward the market-oriented end of the spectrum. Many countries in Europe and Latin America, while primarily market-oriented, have a greater degree of government involvement in economic decisions than does the U.S. economy. China and Russia, while they are closer to having a market-oriented system now than several decades ago, remain closer to the command economy end of the spectrum. A rich resource of information about countries and their economies can be found on the Heritage Foundation’s website, as the following Clear It Up feature discusses. What countries are considered economically free? Who is in control of economic decisions? Are people free to do what they want and to work where they want? Are businesses free to produce when they want and what they choose, and to hire and fire as they wish? Are banks free to choose who will receive loans? Or does the government control these kinds of choices? Each year, researchers at the Heritage Foundation and the Wall Street Journal look at 50 different categories of economic freedom for countries around the world. They give each nation a score based on the extent of economic freedom in each category. The 2015 Heritage Foundation’s Index of Economic Freedom report ranked 178 countries around the world: some examples of the most free and the least free countries are listed in Table 1. Several countries were not ranked because of extreme instability that made judgments about economic freedom impossible. These countries include Afghanistan, Iraq, Syria, and Somalia. The assigned rankings are inevitably based on estimates, yet even these rough measures can be useful for discerning trends. In 2015, 101 of the 178 included countries shifted toward greater economic freedom, although 77 of the countries shifted toward less economic freedom. In recent decades, the overall trend has been a higher level of economic freedom around the world. Markets and government regulations are always entangled. There is no such thing as an absolutely free market. Regulations always define the “rules of the game” in the economy. Economies that are primarily market-oriented have fewer regulations—ideally just enough to maintain an even playing field for participants. At a minimum, these laws govern matters like safeguarding private property against theft, protecting people from violence, enforcing legal contracts, preventing fraud, and collecting taxes. Conversely, even the most command-oriented economies operate using markets. How else would buying and selling occur? But the decisions of what will be produced and what prices will be charged are heavily regulated. Heavily regulated economies often have underground economies, which are markets where the buyers and sellers make transactions without the government’s approval. The question of how to organize economic institutions is typically not a black-or-white choice between all market or all government, but instead involves a balancing act over the appropriate combination of market freedom and government rules. Recent decades have seen a trend toward globalization, which is the expanding cultural, political, and economic connections between people around the world. One measure of this is the increased buying and selling of goods, services, and assets across national borders—in other words, international trade and financial capital flows. Globalization has occurred for a number of reasons. Improvements in shipping, as illustrated by the container ship shown in Figure 3, and air cargo have driven down transportation costs. Innovations in computing and telecommunications have made it easier and cheaper to manage long-distance economic connections of production and sales. Many valuable products and services in the modern economy can take the form of information—for example: computer software; financial advice; travel planning; music, books and movies; and blueprints for designing a building. These products and many others can be transported over telephones and computer networks at ever-lower costs. Finally, international agreements and treaties between countries have encouraged greater trade. Table 2 presents one measure of globalization. It shows the percentage of domestic economic production that was exported for a selection of countries from 2010 to 2013, according to an entity known as The World Bank. 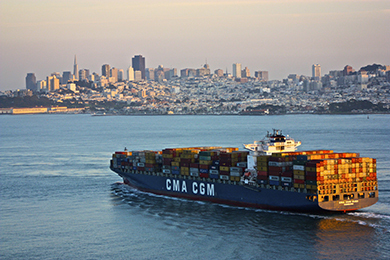 Exports are the goods and services that are produced domestically and sold abroad. Imports are the goods and services that are produced abroad and then sold domestically. The size of total production in an economy is measured by the gross domestic product (GDP). Thus, the ratio of exports divided by GDP measures what share of a country’s total economic production is sold in other countries. In recent decades, the export/GDP ratio has generally risen, both worldwide and for the U.S. economy. Interestingly, the share of U.S. exports in proportion to the U.S. economy is well below the global average, in part because large economies like the United States can contain more of the division of labor inside their national borders. However, smaller economies like Belgium, Korea, and Canada need to trade across their borders with other countries to take full advantage of division of labor, specialization, and economies of scale. In this sense, the enormous U.S. economy is less affected by globalization than most other countries. Table 2 also shows that many medium and low income countries around the world, like Mexico and China, have also experienced a surge of globalization in recent decades. If an astronaut in orbit could put on special glasses that make all economic transactions visible as brightly colored lines and look down at Earth, the astronaut would see the planet covered with connections. So, hopefully, you now have an idea of what economics is about. Before you move to any other chapter of study, be sure to read the very important appendix to this chapter called The Use of Mathematics in Principles of Economics. It is essential that you learn more about how to read and use models in economics. The world we live in today provides nearly instant access to a wealth of information. Consider that as recently as the late 1970s, the Farmer’s Almanac, along with the Weather Bureau of the U.S. Department of Agriculture, were the primary sources American farmers used to determine when to plant and harvest their crops. Today, farmers are more likely to access, online, weather forecasts from the National Oceanic and Atmospheric Administration or watch the Weather Channel. After all, knowing the upcoming forecast could drive when to harvest crops. Consequently, knowing the upcoming weather could change the amount of crop harvested. Some relatively new information forums, such as Facebook, are rapidly changing how information is distributed; hence, influencing decision making. In 2014, the Pew Research Center reported that 71% of online adults use Facebook. Facebook post topics range from the National Basketball Association, to celebrity singers and performers, to farmers. Information helps us make decisions. Decisions as simple as what to wear today to how many reporters should be sent to cover a crash. Each of these decisions is an economic decision. After all, resources are scarce. If ten reporters are sent to cover an accident, they are not available to cover other stories or complete other tasks. Information provides the knowledge needed to make the best possible decisions on how to utilize scarce resources. Welcome to the world of economics! Societies can be organized as traditional, command, or market-oriented economies. Most societies are a mix. The last few decades have seen globalization evolve as a result of growth in commercial and financial networks that cross national borders, making businesses and workers from different economies increasingly interdependent. The chapter defines private enterprise as a characteristic of market-oriented economies. What would public enterprise be? Hint: It is a characteristic of command economies. Why might Belgium, France, Italy, and Sweden have a higher export to GDP ratio than the United States? What are the three ways that societies can organize themselves economically? What is globalization? How do you think it might have affected the economy over the past decade? Why do you think that most modern countries’ economies are a mix of command and market types? Can you think of ways that globalization has helped you economically? Can you think of ways that it has not? The Heritage Foundation. 2015. “2015 Index of Economic Freedom.” Accessed March 11, 2015. http://www.heritage.org/index/ranking. Garling, Caleb. “S.F. plane crash: Reporting, emotions on social media,” The San Francisco Chronicle. July 7, 2013. http://www.sfgate.com/news/article/S-F-plane-crash-Reporting-emotions-on-social-4651639.php. Irvine, Jessica. “Social Networking Sites are Factories of Modern Ideas.” The Sydney Morning Herald. November 25, 2011.http://www.smh.com.au/federal-politics/society-and-culture/social-networking-sites-are-factories-of-modern-ideas-20111124-1nwy3.html#ixzz2YZhPYeME. Pew Research Center. 2015. “Social Networking Fact Sheet.” Accessed March 11, 2015. http://www.pewinternet.org/fact-sheets/social-networking-fact-sheet/. The World Bank Group. 2015. “World Data Bank.” Accessed March 30, 2014. http://databank.worldbank.org/data/. Public enterprise means the factors of production (resources and businesses) are owned and operated by the government. The United States is a large country economically speaking, so it has less need to trade internationally than the other countries mentioned. (This is the same reason that France and Italy have lower ratios than Belgium or Sweden.) One additional reason is that each of the other countries is a member of the European Union, where trade between members occurs without barriers to trade, like tariffs and quotas.